Attorney-General Vickie Chapman is yet to publicly release correspondence from ICAC Commissioner Bruce Lander detailing his opposition to laws before parliament allowing for “open and transparent” public maladministration hearings – that he now claims will be practically unworkable. Lander had publicly called for the right to hold open hearings into maladministration cases where he deemed it appropriate, having been rejected by the former Labor Government in his bid for his highly-charged Oakden inquiry to be held in public. He backed a Liberal Bill amending the law to allow open hearings on his discretion, noting in his recent annual report that “if passed in its original form, [it] would remove the clumsy mechanism for conducting such investigations and would provide the Commissioner with the discretion to hold public hearings in respect of such investigations”. “The Bill was in a form that I largely support… I think it finds the right balance between affording the Commissioner with the powers necessary to conduct a proper investigation while providing adequate safeguards to protect the rights of persons the subject of an investigation,” he wrote last month. However, Labor would not back the legislation unless it went before parliament’s Crime and Public Integrity Policy Committee for review. That review saw the Bill redrafted and reintroduced to parliament last week, with new safeguards for people under investigation, including the right to appeal the process to the Supreme Court. 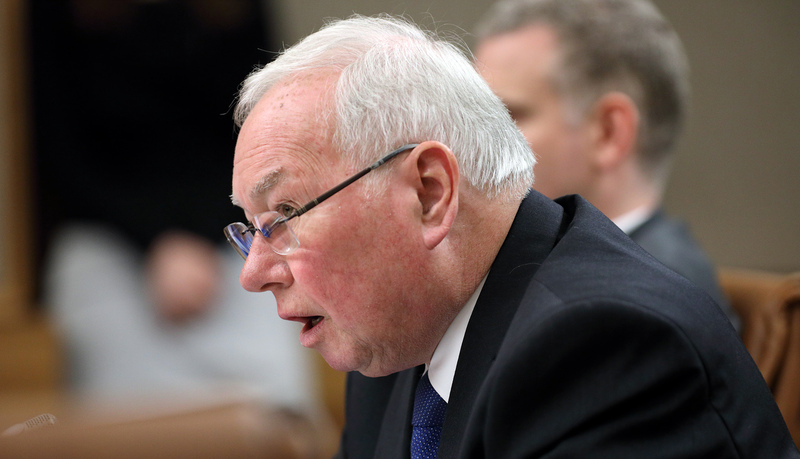 In his appearance before the same committee yesterday, Lander lamented that the new Bill would effectively result in no public hearings taking place, and would instead create “the illusion of public hearings”. “What will happen, in fact, is that the lawyers will move in, they will appeal that process, they will then seek discovery from me as to all of the documents upon which I rely for the purpose of making a determination that I had jurisdiction to investigate the matter,” he said. “What will happen is that lawyers will use this and parties will use this to slow down and stop investigations… It will mean that, in most cases, the risk of carrying out an investigation using a public hearing will be too great, because the investigation itself will be frustrated by the fact of the appeal process. Attorney-General Vickie Chapman has called the Bill a “key election commitment made by the Marshall Liberal Government to ensure open and transparent Government”. However, Lander told the committee he wrote to Chapman “on two occasions before the [re-drafted] Bill was introduced” to detail his concerns, and “asked the Attorney-General whether she would agree to me providing the correspondence to her in respect of that bill” in yesterday’s committee hearing. Her office has not responded to questions as to when and in what forum this will occur. In a statement, Chapman said that “of the eight recommendations raised by the Committee, the Government accepted seven either in full or in part… which reflect the Committee’s recommendations included changes that would ensure all people giving evidence would have the right to legal representation at hearings, and expressly state that a person may refuse to answer a question, provide information or produce a document only if it would tend to incriminate the person of an offence”. “While working through these amendments, the Government ensured the Commissioner received drafts and final versions of the original Bill and amended Bill to allow public hearings in maladministration and misconduct matters,” she said. “Communications received from the Commissioner reiterated his statements from evidence at the Committee, detailing the current situation for judicial review and concerns around appeal rights to the Supreme Court being allowed. The changes to the Bill followed evidence from the Law Society and Bar Association raising concerns about the Commissioner’s powers. Law Society president Tim Mellor told InDaily today “we stand by our submission” and that “there are some things that come at too great a cost, and the loss of representation in those circumstances is in our view a worse outcome than the concern that the Commissioner raises”. He said the Society’s submission emphasised both “the desirability of people being able to be represented at all stages before the ICAC, but also the importance of a review being available through some appeal process, to ensure the powers granted the Commissioner are being properly utilised”. “The ICAC is a body which has very extensive powers, and the important thing in that is to make sure there are adequate safeguards and checks and balances available, to ensure those powers aren’t inappropriately used,” he said. “What’s the fundamental issue in terms of the rights of those people called before ICAC? The one concern in my view is not the convenience of the ICAC… you can’t view that as being the primary concern in these matters.